The number of households in fuel poverty has risen from 2.35 to 2.38million. Some households close to the fuel poverty threshold have seen a lower than average increase in disposable income, and therefore, been pushed into fuel poverty. Fuel prices have increased more than energy efficiency gains, leaving households with higher energy costs. In 2014, 6.8% of fuel poor households were living in a property with an energy efficiency rating of band ‘C’ or above, compared to 1.5% in 2010. 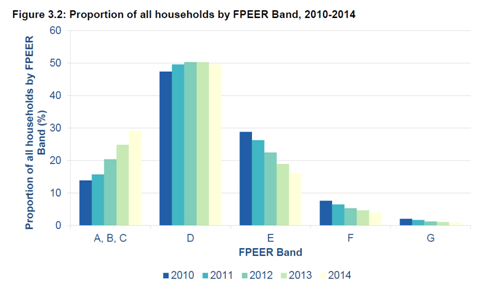 A continued reduction in fuel poor households in bands ‘F’ and ‘G’. Throughout the findings it finds that Households with lower energy efficiency bands have a higher likelihood of being fuel poor. There are many characteristics that are used to derive whether a household is in fuel poverty and to add further complication England, Wales, Northern Ireland and Scotland use different indicators, but overall the following characteristic determine fuel poverty. Location: Regional differences affect the level and depth of fuel poverty and are related to age of the housing stock, climatic conditions and relative income levels across the country. The North East, Yorkshire and the Humber, West Midlands and the South West of England have the highest proportion of households in fuel poverty compared to the East and South East. Households living in private rented houses have the highest prevalence of fuel poverty whereas owner occupied households have the lowest. Single parent households have the highest levels of fuel poverty and households consisting of only those aged 75 and over have the lowest prevalence. 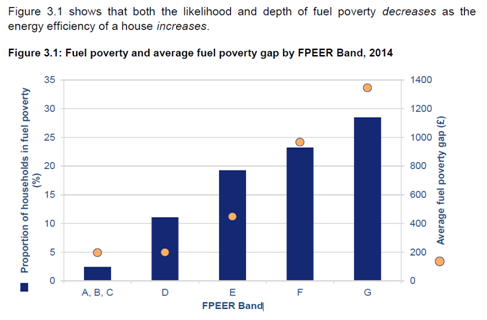 Unemployed households have higher levels of fuel poverty. As Elmhurst and its members know the EPC is the proven reflection of the energy efficiency of the property. If the targets are to be achieved by 2020, then the F and G proportions in the table below need to be reduced, and E rated properties need to be targeted next. The statistics prove extremely valuable and suggest that there are 2.38million households that are deemed to be in Fuel Poverty. Here at Elmhurst we welcome the fact that DECCs flagship policy the Energy Companies Obligation (ECO) is heading towards tackling fuel poverty, especially in light of the fact that more families are in heading into fuel poverty. As you may know the new ECO policy is in consultation at the moment, Elmhurst has heavily commented on this new policy direction (see other news articles). The pot of money in ECO has been reduced from £870m to £640m per year, DECC estimate that in 2017-2018 that 160,000 households will have measures installed under affordable warmth (ECO). However – it is removing the connection to EPCs and RdSAP. The policy is not targeted at the E, F or G rated properties. Why not? We also wonder why? We believe that only by measuring can you manage any given process. The ‘measurement’ that is EPCs must be part of the process. Properties should be targeted that are the least energy efficient (E, F and Gs) and home owners should be left with the EPC. This is the truthful position of their property afterwards, also indicating other measures that could be available. If the measurement is removed, how will the policy meet the targets and genuinely remove people from fuel poverty?